Often, children are too excited about Christmas to focus on the Advent season. 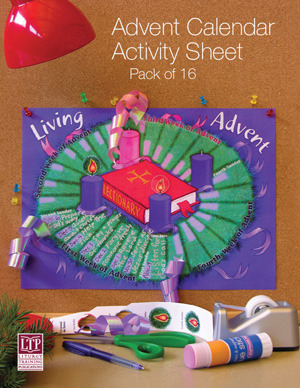 Help the children and families in your parish to discover Advent using this beautifully-illustrated Advent calendar. The calendar features daily Scripture citations, information about saints’ feasts and Holy Days of Obligation, and suggestions for activities and reflection. Children or families can glue candle symbols to the calendar each day to count down the days until the Nativity of the Lord! Each pack also includes reproducible instructions that provide catechists and/or parents with the background information they need and suggestions on how to use the sheet as a learning tool. * Please note that the calendar for Liturgical Years A, B and C printed at the back of the Activity Sheet is based on years 2009, 2010 and 2011. What Am I Doing for Advent This Year?